HP have issued a statement (here) and are planning to release an optional update in around 2 weeks time which will resolve the issue. "We updated a cartridge authentication procedure in select models of HP office inkjet printers to ensure the best consumer experience and protect them from counterfeit and third-party ink cartridges that do not contain an original HP security chip and that infringe on our IP. 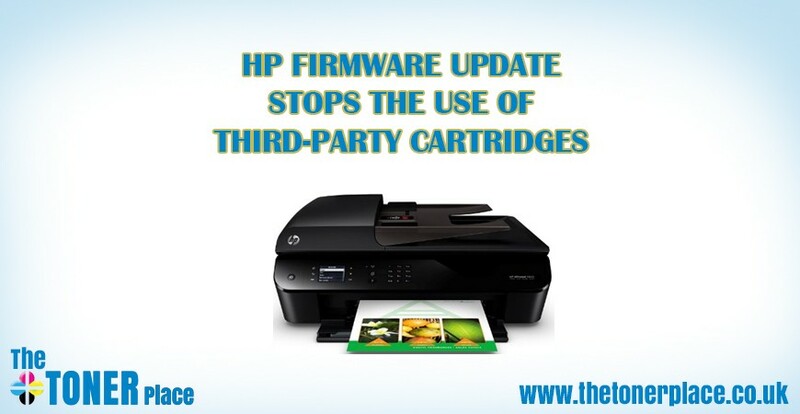 HP printers and original HP ink products deliver the best quality, security and reliability. When ink cartridges are cloned or counterfeited, the customer is exposed to quality and potential security risks, compromising the printing experience. As is standard in the printing business, we have a process for authenticating supplies. The most recent firmware update included a dynamic security feature that prevented some untested third-party cartridges that use cloned security chips from working, even if they had previously functioned. We should have done a better job of communicating about the authentication procedure to customers, and we apologize. Although only a small number of customers have been affected, one customer who has a poor experience is one too many. It is important to understand that all third party cartridges with original HP security chips continue to function properly. As a remedy for the small number of affected customers, we will issue an optional firmware update that will remove the dynamic security feature. We expect the update to be ready within two weeks and will provide details here." The Toner Place is expecting new stock with updated chips next week for anyone who wishes to keep their current firmware and we will replace any cartridges you have bought from us that show the damaged cartridge error. We will make the new firmware available on our site when it becomes available. If you own an HP printer, you may have recently been notified that one or more ink cartridges for your printer are “damaged” and need replacing. This is due to a firmware update by HP in March 2016 (or earlier) containing DRM (Digital Rights Management) that seems to have been set to disable third-party cartridges on September 13th 2016. Printer ink cartridges are extremely pricey. To lower costs, many consumers opt to purchase third-party compatible cartridges. Manufacturers of the printers such as HP say that you should always use official consumables to prevent your printer clogging up, which can increase the lifespan of your printer. There is, however, little evidence that using official cartridges provides any real benefit. This blocking of third-party cartridges by HP is an underhanded and aggressive move. HP has never hidden the fact that they don’t like third-party cartridges, but they really should have warned their customers who are now unable to print and have little choice but to buy genuine cartridges just to get themselves back up and running. Unfortunately, due to this update, you will not be able to use any third-party cartridge from any supplier until replacement chips have been created and installed to all the compatible cartridges at the suppliers and distributors. We anticipate that this process will take a couple of weeks and will update our site once we know any further information. Some users are reporting that disabling the automatic updates in the printers' menus may not prevent this occurring in the future, as Windows update automatically updates printer drivers and this can include the firmware. If you have bought these from us and you have this issue, please contact us on 01423 226448 or by using the contact form for assistance.